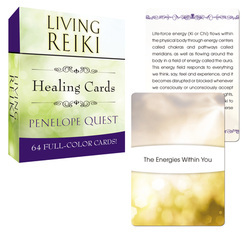 Penelope Quest is the author of a number of best-selling and award-winning books on Reiki, all published in the UK by Piatkus and in the USA by Tarcher/Penguin, and available in both paperback and Kindle editions. There is a lot more detail about each on their relevant web pages, including chapter titles and pictures of the covers of any additional editions, but there are brief details given below the next item. 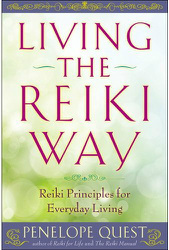 This updated and considerably expanded edition of "Reiki for Life" (now 410 pages) was published in paperback and Kindle editions by Piatkus in April 2012. There is also an American edition, published in 2010 by Tarcher/Penguin based on the original UK 2002 edition of "Reiki for Life" which won the Nautilus Books Silver Award in the USA in 2011, and was nominated as "Best Reiki Book" in the About.com Readers' Choice Awards in 2012. Co-written with her daughter Kathy Roberts, "The Reiki Manual" was published in paperback and Kindle editions in the UK by Piatkus in 2010, and in the USA by Tarcher/Penguin in 2011. The American edition won the Nautilus Books Silver Award in 2012. Published in paperback (2010) and Kindle editions (2012) in the UK by Piatkus. Also published in the USA by Tarcher/Penguin in the summer of 2013. Published in paperback (2007) and Kindle (2012) editions in the UK by Piatkus, and in the USA in 2012 by Tarcher/Penguin.